Watch as we apply some Jade Quartz to the Impossible Detail Mercedes! 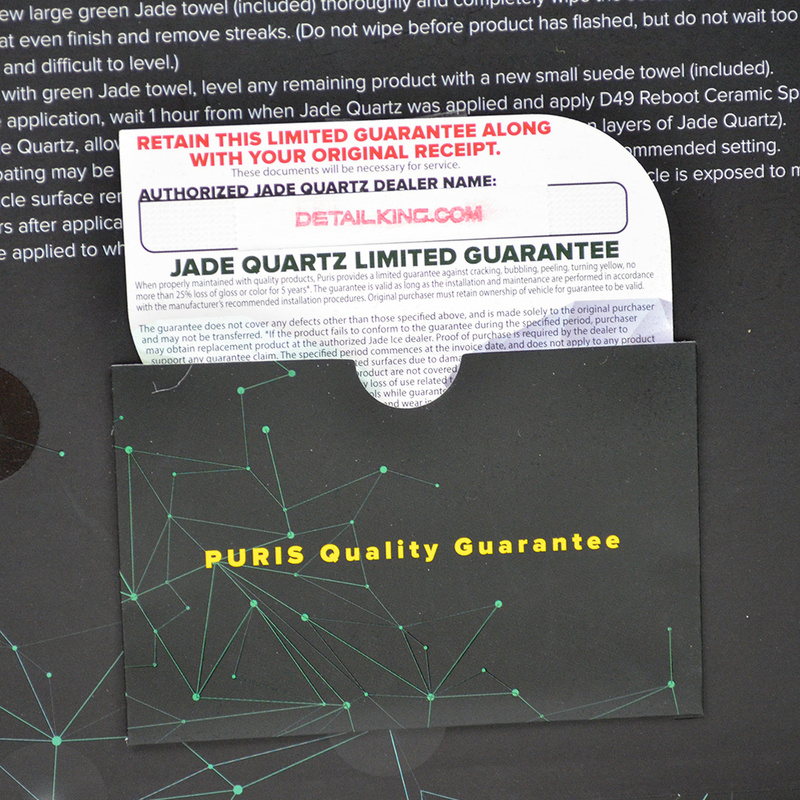 JADE QUARTZ by Puris is our best Ceramic Coating and will provide unrivaled gloss and up to 4 years of durability and protection from UV rays and corrosion. Jade Quartz is considered to be a 9H on the ceramic hardness scale. Once treated with JADE QUARTZ, it will repel water and contaminants while maintaining a clear, hard-as-nails finish. JADE QUARTZ stays cleaner longer, require less frequent polishing, and require no additional paint protection unless desired. Jade Quartz is a self-cleaning, anti-static, weather-resistant ceramic nano coating that provides unrivaled protection. JADE QUARTZ works on the molecular level to transform the surface. If you are a certified Jade Coating installer ask us for the Jade Carfax forms so you can submit your customer's vehicle information to now be included in the Carfax report. By including the Jade coating information in the Carfax report will add value when the car is marketed to be sold. 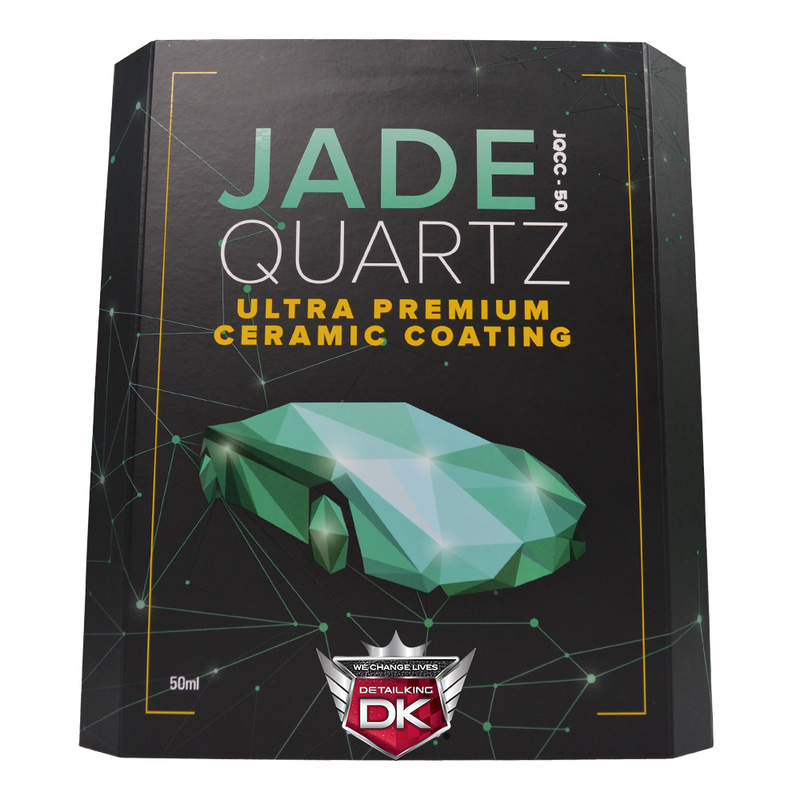 Jade Quartz is a clear, nano crystalline coating that protects your vehicle from weather, chemicals, and UV rays while repelling water, dirt and other contaminants. Jade Ice applies a hard (9H), durable coating that is 2-3 micron thick and imparts a deep, reflective shine. You can order Jade Quartz 2 different ways above. One option is geared towards the car enthusiast that wants enough product to apply to at least 3 medium sized vehicles. 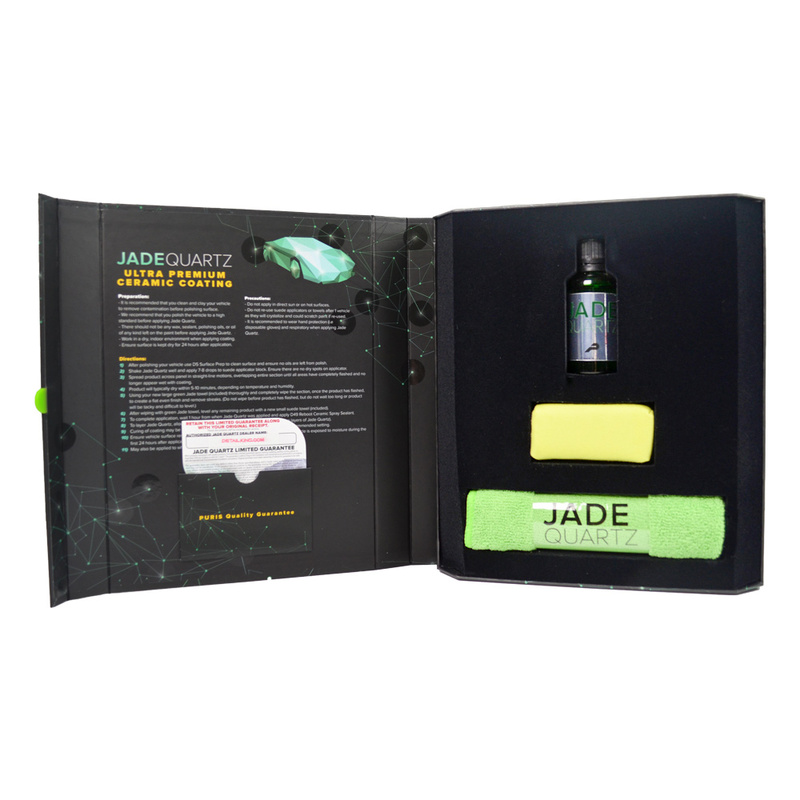 The car enthusiast kit will receive the 50cc bottle of Jade, microfiber applicator, microfiber suede cloth, Jade 4 year guarantee card and Puris storage box complete with application instructions. If you are a professional installer of ceramic coatings you probably do not need the storage box or microfiber suede cloth. If you check this option above you will receive the 50cc bottle of Jade, 1 applicator and 3 guarantee cards. 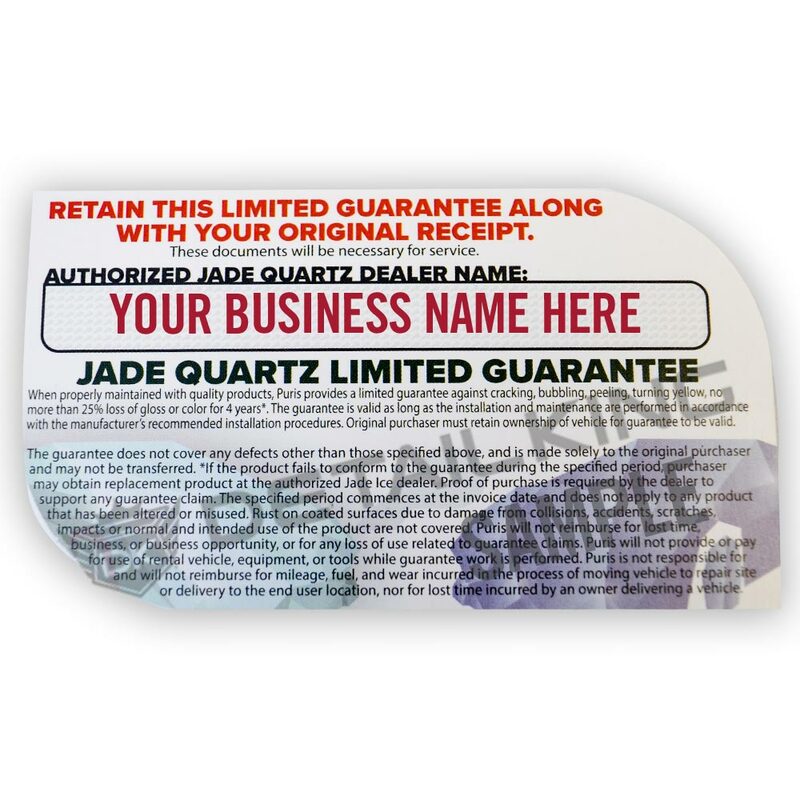 We will also include 3 Jade Window Cling Reminder Stickers to ensure your customers remember to return to you for their maintenance washes and Reboot treatment! JADE QUARTZ stays cleaner longer, require less frequent polishing, and require no additional paint protection! We recommend our Reboot Silica Spray as a top coat that can be applied periodically after washes. Our Jade Quartz Premium Ceramic Coating is much like the clear coat that already exists on the vehicle, except it forms an invisible skin of protection that is much brilliant, sleeker, and less decumbent to wash-induced swirls and micro marring. Jade Quartz creates an easy to clean finish that is considerably easier to maintain compared to traditional polishes, sealants and waxes. This is the finest ceramic coating on the market, you have to try it to believe it. Before applying Jade Ice, you will want to prep the surface with our Refresh Surface Prep to ensure the surface is clean and free of any wax, compound, polish, or sealant residue. DIRECTIONS: Wrap a microfiber Suede cloth around the applicator block. 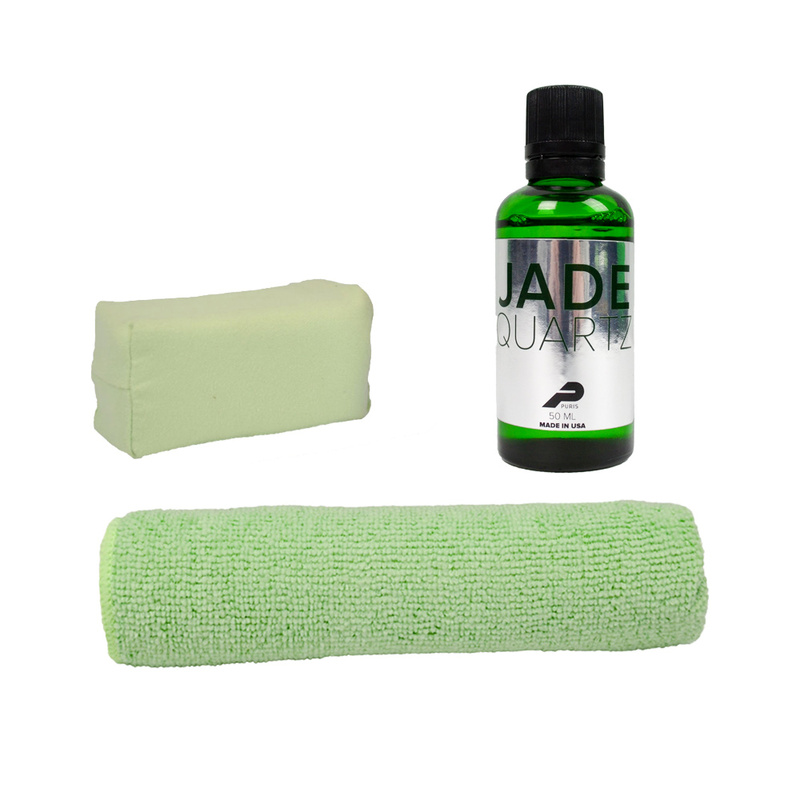 Shake JADE QUARTZ well and apply 3-4 drops to Suede microfiber. Starting at the middle of the panel first wipe left and right, spreading product across panel, overlapping entire section or panel until all areas have completely flashed and no longer appear wet with coating. Using a clean, dry microfiber suede cloth, thoroughly and completely wipe the panel or section to create a flat even finish. Move to next panel and repeat. To layer JADE QUARTZ, allow 1 hour between coats. Small microfiber suede cloths should be used on no more than 2 panels and submerged in water, excess squeezed out, before being bagged and disposed of. If you need to perform paint correction to the vehicle prior to applying Jade Quartz a great choice would be our Caliber Silica Primer Polish as your light to medium duty paint correction product. For regular maintenance washes our Detox Wash & Seal for Ceramic Coatings is the perfect car wash shampoo. This product is not permitted to ship by air, it must ship by ground. If this product is included with other items that you order and you request air shipping it will not be packaged with the rest of your order. You could be charged an additional shipping fee because it must be shipped separately due to it being sent ground. Please note this product is known as a Limited Quantity chemical through the PA Dept. of Transportation and is not allowed to ship USPS, please choose UPS.